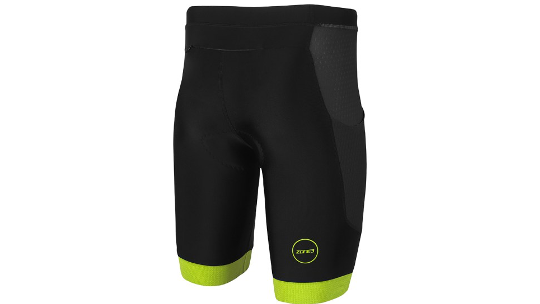 The Aquaflo short has been designed for those that prefer the two-piece option rather than the TriSuit. Some may find the two-piece is more comfortable, more versatile for an array of sports and also more aesthetically pleasing. Zone3 designed this short with a number of groundbreaking technology features that ensure you remain as fast and comfortable as possible for Super Sprint, Sprint and Olympic Distance racing. Aquaflo™ technology comes with hydrodynamic features that reduce the amount of drag you experience in the water thanks to a Teflon coating on the shorts. You will also find two rear pockets that provide aerodynamic storage for all your favourite gels and food. Compression provides increased blood supply to your lower leg muscles that help to reduce fatigue and increase recovery time. New wider grippers give even pressure distribution and added comfort to the silicone style grippers. These are stitched to the bottom of the leg material rather than inside to create a more comfortable fit and do a fantastic job of preventing any movement during the cycle and run.